Take the autobahn in the direction of Salzburg to the Innsbruck junction. On A93, take direction Kufstein. Exit Kufstein-Süd, direction St. Johann/Felbertauern. After passing the village of Going, you will see on the left hand side Guest House Stanglwirt. 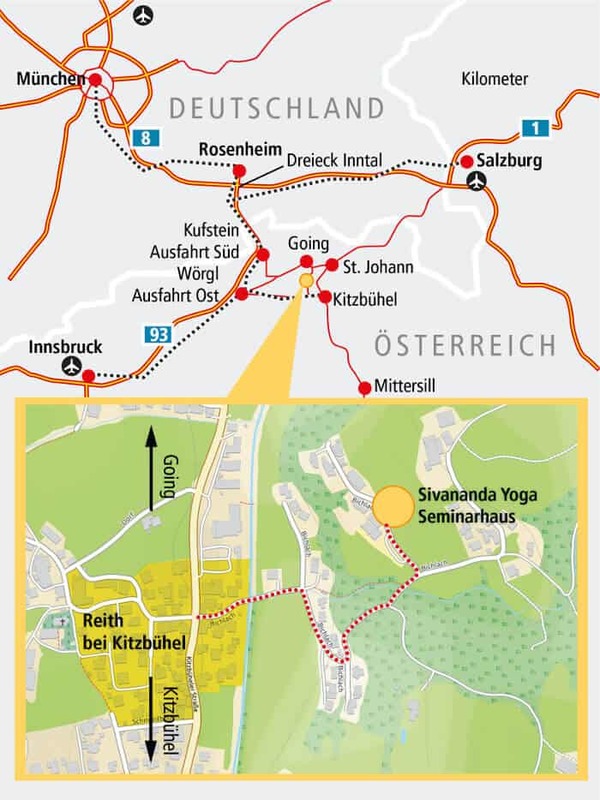 Take a right there to Reith-Kitzbühel. After 5 kilometres you will reach Reith. Drive through the village until you see the Volunteer Fire Brigade on the left hand side. Turn left here and follow the signs to “Sivananda Yoga”. Autobahn Vienna-Salzburg. Via Berchtesgaden, Lofer, St. Johann in Tyrol to Kitzbühel, then continue in the direction of Wörgl through the tunnel. After the Schwarzsee, turn right to Reith. Drive through the village until you see the Volunteer Fire Brigade on the right. Drive past, take your next right and follow the signs to “Sivananda Yoga”. “Four Seasons” from Munich from €56 (one-way) or €96 (roundtrip) per person.